On the second day of our vacation, we were at the paragliding meeting site at 7:45am. When the thrill seekers got on the tram to go up the mountain, I wandered down to the landing site, which happened to be in the hotel’s front yard. Since this was not my adventure, I have no firsthand experience to share about anything that happened out of my sight. I can, however, show you some photos I took of Andrew and Hannah heading out, floating around, and landing. You’ll find those below. But that’s not what my story is about. After Andrew and Hannah landed, and the pictures had all been taken, we walked back to the Village for breakfast at The Mangy Moose. Over Huevos Rancheros, Hannah told us that her paragliding instructor had let slip that at the 9am launch they were gliding with Stephen Colbert. To verify that, she poked around the web and came up with a Colbert tweet that said “‏@StephenAtHome I’m on vacation for a week. I won’t say where, but it rhymes with Florida. That’s right, I’m going to the secret rich person island Shmorida.” I reacted like a bear after huckleberries during the drought. I wanted to see Stephen Colbert. Andrew and Hannah were game, to a point. We walked back to the landing site together, right on time to see the 9 o’clock group descending. The scene on the ground was the same as the one we had participated in an hour earlier. There were a handful of people with cameras trained on the sky waiting for their loved ones to land. There were no paparazzi, no fans with autograph books; nothing to indicate that this was anything other than a normal gathering to watch crazy people fall out of the sky. While we watched, I struck up a conversation with a woman who turned out to be from Newton. She and her two children were waiting for her husband to land. Once her husband was safely on the ground, they left, leading me to believe that they were unaware that Stephen Colbert was among their group. That, or they were just too cool for school and didn’t care. By the time Mr. Colbert landed, there were only a few people left at the site. It was the ideal setting in which to accost a celebrity. Andrew and Hannah were standing off to the side pretending they didn’t know me as I slid closer to Mr. Colbert. I waited until he was out of his gear and seemed to be wrapping up. 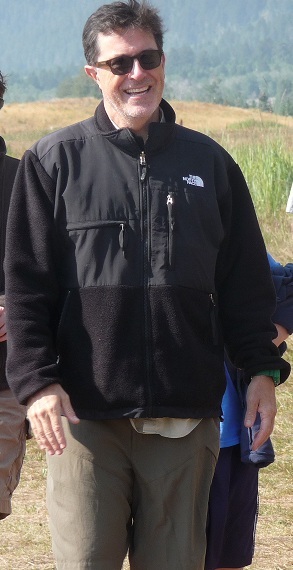 Then I walked up to him, held out my hand and said, “Judy Mintz. And may I just say, Florida Shmorida.” He shook my hand and nodded without paying too much attention. I was just another fan, nothing special, nothing interesting. I stepped back. When he stopped to pose for a photo for one of the paragliding crew, I snapped a few pictures of my own. Stephen Colbert purports to hate bears, which makes Wyoming a strange vacation choice since it’s peppered with signs warning you to be “Bear Aware,” and tourists are encouraged to carry Bear Spray. Despite all the warnings, we never saw a bear. Maybe Mr. Colbert knew his chances of seeing a bear were slim compared to the likelihood that he’d be bothered by a fan. Maybe he packs Fan Spray. If so, I’m glad he didn’t consider me a big enough threat to use it. 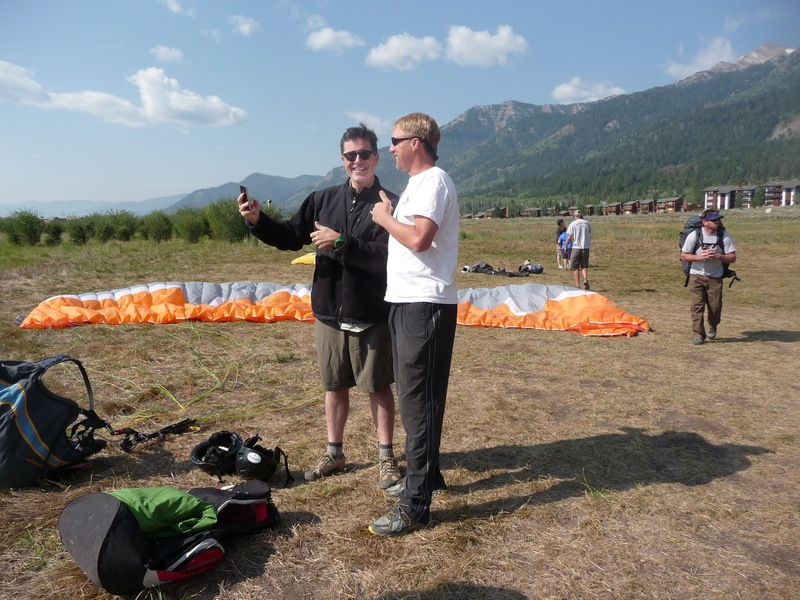 This entry was posted in Uncategorized and tagged bears, Jackson Hole, paragliding, Stephen Colbert, Teton Village, Wyoming. Bookmark the permalink.